Roulette bets. It seems that they are most interesting thing about the roulette game. It is really easy to learn them and later count your potential winnings. Everyone wants to win and none can be blamed for it. But there is one thing which everybody should keep in mind. Gambling successfully means gambling right. Certainly, there are vacation gamers, who do not really care about the bets and the payouts. But if you want to be a professional vacation player, you should know some basics (roulette rules) of the game. 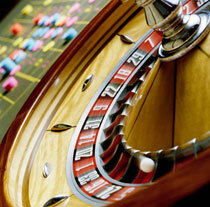 Another aspect that concerns the bets is to know the roulette table limit. It is supposed that the usual table limit is about $1,500 but of course, that may be changed in different casinos and tables as well. There are two types of bets: inside and outside. Inside bets are those, which are placed on one or more numbers. The payouts in the inside bets are higher than in the outside, as there is better chance to win. Straight bet covers only one number and has the largest payout. The chances to win are 1/37. Split bet covers two numbers and the winning chances are 1/19. Street or Trio bet covers 3 numbers at the same time. The odds are 1/11.67. Corner bet covers any four numbers and the winning chances are 1/8.5. Five Number bet clearly cover five numbers and is possible in American roulette only. The odds are 1/6.6. Six Line bet covers six numbers and the chances to win are 1/5.33. Outside bets are called that way as they are not placed on the layout, which covers the numbers. They simply cover the sets of numbers. Column bet covers twelve numbers, which make any of three lines on the layout. There are three column bets possible. Winning chances are 1/2.17. 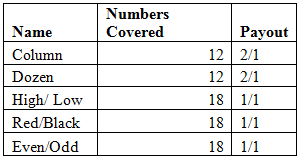 Dozen bet covers twelve numbers. There are 3 dozens: 1st is 1-12, 2nd is 13-24, 3rd is 14-36. The odds are the same as in the column bet. Odd/Even, Red/Black, High/Low bets cover 18 numbers and the chances to win are 1/1.11. 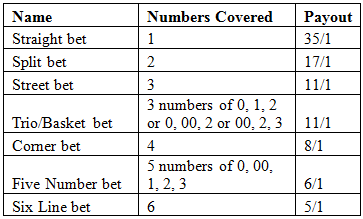 Low bet means that numbers 1 through 18 are covered, while High bet means that the number 19 through 36 are covered.